This security poster illustrates the TC/3.6 & TC/6 Italian Anti-Tank Mines. These mines are the larger and smaller version of the same mine. The mines feature distinctive “ribs” common to many Italian mines. These mines incorporate an over blast system to withstand over pressure clearance. 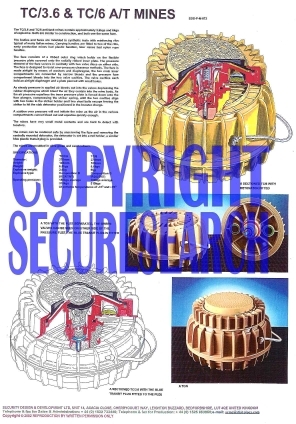 This security poster features photographs of the TC/6, one with the fuze separated, a sectioned TC/6 with detonator fitted, and a sectioned TC/3.6 with the blue transit plug fitted to the fuze. The security poster also shows the technical specifications of both the TC/3.6 & TC/6 anti-tank mines. A sectioned TC/6 with detonator fitted. A sectioned TC/3.6 with the blue transit plug fitted to the fuze. Photographs of the TC/6, one with the fuze separated. The technical specifications of both the TC/3.6 & TC/6 anti-tank mines. This security poster features the technical specifications of both the TC/3.6 & TC/6 anti-tank mines, photographs of the TC/6, one with the fuze separated, a sectioned TC/6 with detonator fitted, and a sectioned TC/3.6 with the blue transit plug fitted to the fuze.